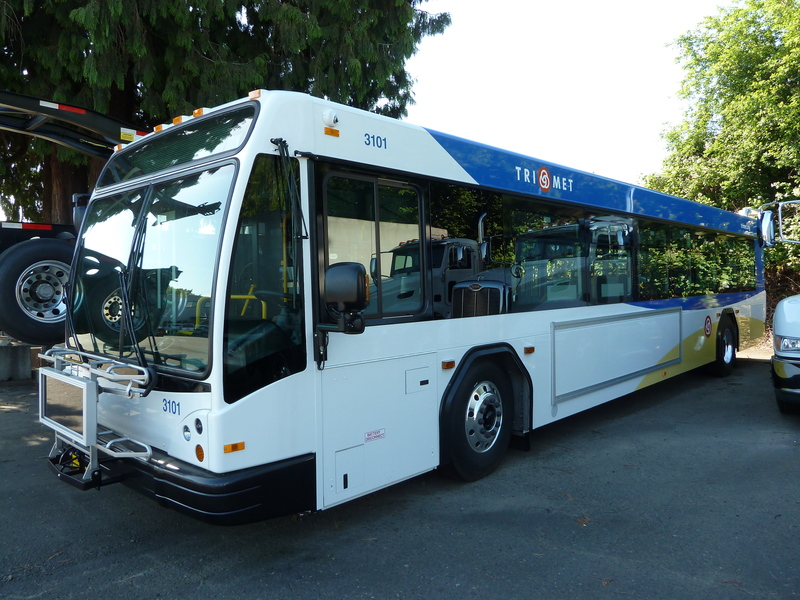 Today, TriMet put into service the first six of 70 new buses to be added to the fleet this summer and fall. Riders may have ridden on or seen the six new buses on Line 70 this morning. Over the coming weeks, riders will begin to see the new buses, referred to and numbered the 3100-series, on various routes throughout the region. The 3100s are more fuel and emissions efficient and include operator and rider improvements. Like the buses delivered last year, the 3000s, each bus comes with standard air conditioning, automatic stop announcements, easy-to-clean vinyl seats and interior surfaces, larger windows, low floors, handrails and a gently sloping floor at the rear exit, a next-generation GPS dispatch/tracking system and improved windshield visibility for operators. Many of the exterior features of the new buses match those of the 3000s including a bright, easy-to-read LED overhead sign on the front of the bus, electric starters for quieter starts, automatic drop-down snow chains, brighter, energy-efficient LED headlights with cornering lights and turning signal lights on the mirrors for safety. Passenger seats have a composite seat frame that weigh less, cost less and should show less dirt and finger prints than the stainless steel frames and backs in the 3000s. Boarding the vehicle will be even easier for customers in mobility devices due to slight modifications to the lift mobility ramp and a new ramp guard added to help direct mobility devices further into the bus before turning down the aisle. Ramp warning light inside the vehicle will alert customers on the bus that the ramp is going to deploy. Higher quality digital cameras, with better image quality, hard drives and improved positioning. Operator seats are more adjustable, including the ability to adjust the front of the seat cushion for varying degrees of thigh support or comfort. Interior side walls will now match the color and texture of the modesty panels, or panels that separate the high seats over the rear wheel well and the seat at the low-floor level. One bus a day will come off the assembly line in Hayward, CA. Gillig, the manufacturer, will deliver three to five buses per week for roughly 18 weeks this summer and fall. It will take TriMet staff two weeks to get them service ready including DMV title, license and registration. The new buses cost $413,000 each and will be distributed between two TriMet garages, Merlo Garage in Beaverton and Center Street Garage in SE Portland. TriMet will begin to replace fleet vehicles that are highest on the retirement priority list. The 3100-series have a 2013 EPA compliant engine that has a bit more fuel and emissions efficiency than previous models. The low-emission engines keep pollutants out of the air. Like the 3000-series buses the new buses have a Cummins Diesel Engine package designed to reduce tailpipe emissions dramatically. This includes Selective Catalytic Reduction technology, which scrubs nitrogen oxides and particulates (pollutants that cause smog and health problems) from the exhaust. Additionally, the transmission has a load-based shifting program that can tell when the bus is on a hill with a lot of riders, and shifts accordingly to match conditions. Testing in a few 2900s and 3000s has shown improved fuel economy. Like the 3000 buses, the 3100s have an innovative cooling system that TriMet pioneered, improving fuel efficiency by 5-10 percent. Already in use on many of our buses, it uses an electrified subsystem instead of a hydraulic or mechanical fan, so it draws less power off the engine. The agency delayed new bus purchases for a few years due to the recession, however in 2012 TriMet General Manager Neil McFarlane accelerated the bus replacement schedule to address TriMet’s aging bus fleet that had become more expensive to maintain and less reliable. Some buses in the fleet are more than 18 years old. In 2012 the agency purchased 51 diesel and 4 new hybrid buses. This year the agency will purchase 70 forty foot diesel buses, the largest order in the accelerated bus purchase. Over the next three years TriMet will add another 184 buses. By 2016, the average age of our fleet will be the industry recommended standard of eight years. By 2017, TriMet will have replaced all of the remaining high-floor buses in the fleet, those with steps at the door.